Send shivers up their spines- serve everyone a shot in their own molded ice glass. Chill your favorite drinks and enjoy them -- cold to the bone! Easy to use, just fill the flexible silicone rubber tray with water or your favorite fruit juice, freeze, and voila - a fun way to cool your favorite drink. Then, pop them out to create an icy array of Skulls Shot Glasses or Edible Dessert containers that will shake your timbers! For extra fun, try Jello bites or shots recipes for a cool confection, or try filling with melted chocolate for a sweet treat! Make your own edible shot glass from ice, chocolate or candy melt candy, gelatin, cookie dough, crisped rice cereal treats and more. Just fill, freeze and invert the silicone mold to release. 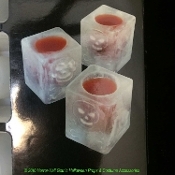 Give your guests a little fright with spooky Skull and Crossbones ice mold shot glasses! Drink up, me hearties! Y’arrrrrr mateys, there be nothin' amiss with this treasure! Keep your grog cold with SKULLS and CROSSBONES shot glasses. Tray form makes eight shot glass or dessert forms. Each individual mold form measures approx 2-inch (5cm) Diameter x 2.25-inch (5.63cm) Deep. Inside diameter is approximately 1-1/8-inch or 30mm. Depth 44mm. *Helpful tip: Because the SBS plastic silicone is flexible, it will be easier to fill with water and place in the freezer if you put it onto a small baking sheet first for stability. Bar, Kitchen or Dining Room Decor Accessory Punk Pirate Party Pub Castle Haunt Prop, as pictured.